A breakdown of information about the comparison of five European countries in term of the monthly spending on different need is presented in the table. The value is measured in percent. Overall, it is important to note that a significant portion of income of selected countries goes on Housing, while clothing is the least in their preference list. Housing is the largest expenditure item. France, Germany and the UK spend almost one third of their income on this. In contrast, they spend around a quarter on food and drink. However, this pattern is reversed for Turkey and Spain, who spend around a fifth of their income on housing, but 10% and 15% respectively on food and drink. The nation's Spending on entertainment is slightly more than clothing. The expenditures for France and Spain are minor, while the other three countries pay out much the same amount, ranging between 13% and 15%. 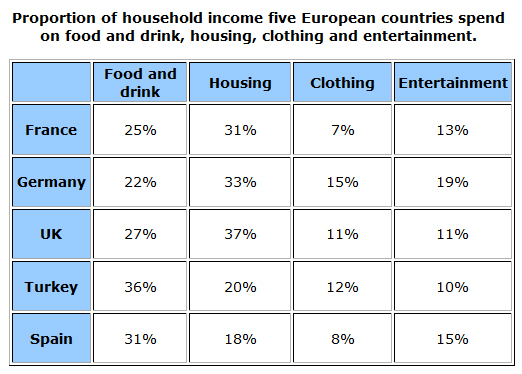 19% of income use for entertainment in Germany, whereas UK and Turkey expense only half this amount. In case of France and Spain, the spending are between those other three nations. Hello! I will give you some opinions about your essay. (1) A breakdown of the information about thea comparison of (...) on different needs is presented in the table. (4) T... on entertainment is slightly (you need a noun) more than clothing.